Chanteur Country US né 18 Juillet 1954 à Cordell (Kentucky), Ricky Skaggs a débuté très jeune comme multi-instrumentiste (mandoline, guitare, fiddle). Il joua avec les "Clinch Mountain Boys" (70-73), les "Country Gentlemen" (74), le "Hot Band" d'Emmylou Harris (77). Après un album pour Sugar Hill Records, Ricky signe avec Epic et produit lui-même ses albums, qui tous se classeront au Top 10 Country. Il est devenu l'un des grands de Nashville. By the time he was in his mid-thirties, Kentuckian Ricky Skaggs had already produced a career's worth of music. At age seven he appeared on TV with Flatt & Scruggs; at 15 he was a member of legendary Ralph Stanley's bluegrass band (with fellow teenager Keith Whitley). None of his '80s peers, male or female, had better musical credentials than Skaggs. The term "multi-talented" lacks the power to characterize this extraordinary singer and instrumentalist. Not only can he sing and pick with the best in progressive country, his broad and deep experience in traditional music separates him from the crowd. In the estimation of many, he is without peer as a combination Vocalsist and instrumentalist (guitar, mandolin, fiddle, banjo). After playing with Ralph Stanley for three years, Skaggs moved on to progressive bluegrass bands the Country Gentlemen and J.D. Crowe & the New South. With his own band, Boone Creek, he mixed the old and the new, adding Django Reinhardt. Skaggs took Rodney Crowell's place in Emmylou Harris' Hot Band in 1977, and the band's excellent Roses in the Snow album showcased Skaggs' versatility. Two number one hits came out of his 1981 album Waitin' for the Sun to Shine, and the awards started arriving. Skaggs is largely responsible for a back-to-basics movement in country music. He showed many that a bluegrass tenor with impeccable taste and enormous talent could sell traditional country in the '80s, a time when pop music had invaded the land of rural rhythm. Skaggs began playing music at a very early age, being given a mandolin from his father at the age of five. 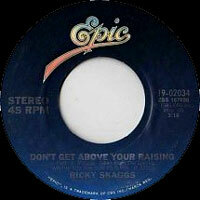 Before his father had the time to teach Ricky how to play, the child had learned the instrument himself, and by the end of 1959, he had performed on-stage during a Bill Monroe concert, playing "Ruby Are You Mad at Your Man" to great acclaim. 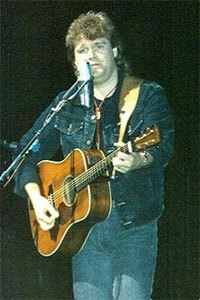 Two years later, when Skaggs was seven, he appeared on Flatt & Scruggs' television show, again to a positive response. Shortly afterward, he learned how to play both fiddle and guitar and began playing with his parents in a group called the Skaggs Family. In addition to traditional bluegrass, Skaggs began absorbing the honky tonk of George Jones and Ray Price and the British Invasion rock & roll of the Beatles and the Rolling Stones. In his adolescence, he briefly played in rock & roll bands, but he never truly abandoned traditional and roots music. During a talent concert in his midteens, he met Keith Whitley, a fellow fiddler. The two adolescents became friends and began playing together, with Whitley's brother Dwight on banjo, at various radio shows. By 1970, they earned a spot opening for Ralph Stanley. Following their performance, Stanley invited the duo to join his supporting band, the Clinch Mountain Boys, and they accepted. Over the next two years, they played many concerts with the bluegrass legend and appeared on his record Cry From the Cross. 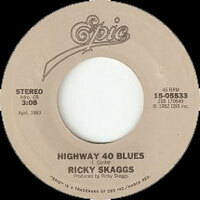 Skaggs also appeared on Whitley's solo album Second Generation Bluegrass in 1972. Though he had made his way into the bluegrass circuit and was actively recording, Skaggs had grown tired of the hard work and low pay in the Clinch Mountain Boys and left the group at the end of 1972. For a short while, he abandoned music and worked in a boiler room for the Virginia Electric Power Company in Washington, D.C., but he returned to performing when the Country Gentlemen invited him to join in 1973. Skaggs spent the next two years with the group, primarily playing fiddle, before joining the progressive bluegrass band J.D. Crowe & the New South in 1974. The following year, he recorded another duo album with Whitley, That's It, and then formed his own newgrass band, Boone Creek, in 1976. In addition to bluegrass, the outfit played honky tonk and Western swing. Boone Creek earned the attention of Emmylou Harris, who invited Skaggs to join her supporting band. After declining her several times, he finally became a member of her Hot Band once Rodney Crowell left in 1977. Between 1977 and 1980, Skaggs helped push Harris toward traditional country and bluegrass, often to great acclaim. 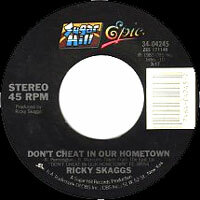 Skaggs also pursued a number of other musical venues while he was with Harris, recording a final album with Boone Creek (1978's One Way Track), two duo albums with Tony Rice (1978's Take Me Home Tonight in a Song, 1980's Skaggs & Rice), and finally, his first solo album, Sweet Temptation, which was released on Sugar Hill. Sweet Temptation was a major bluegrass hit, earning the attention of the major label Epic Records. The label offered him a contract in 1981, releasing Waitin' for the Sun to Shine later that year. The album was a big hit, earning acclaim not only in country circles, but also in rock & roll publications. By the end of the year, Skaggs had become a star and, in the process, brought rootsy traditional country back into the consciousness of the country audience. During 1982 and early 1983, he had five straight number one singles — "Crying My Heart Out Over You," "I Don't Care," "Heartbroke," "I Wouldn't Change You If I Could," "Highway 40 Blues" — as well as earning numerous awards. Later in 1982, he was made the youngest member of the Grand Ole Opry. For the next four years, he was a major artistic and commercial force within country music, raking up a string of Top Ten hits and Grammy Award-winning albums. His success helped spark the entire new traditionalist movement, opening the doors for performers like George Strait and Randy Travis. Toward the end of the decade, Skaggs wasn't charting as frequently as he had in the past, but he had established himself as an icon. Each of his records sold well, and he collaborated with a number of musicians, including Rodney Crowell, the Bellamy Brothers, Johnny Cash, Jesse Winchester, and Dolly Parton. During the early '90s, Skaggs and his traditional music were hit hard by the slick sounds of contemporary country, and consequently, his records ceased to sell as consistently as they had ten years earlier. Columbia Records dropped the musician from their label in 1992 due to poor sales. However, Skaggs continued to perform concerts and festivals frequently, as well as host his own syndicated radio program, The Simple Life, which hit the airwaves in 1994. 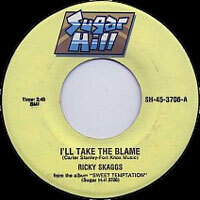 The following year, Skaggs returned to recording with Solid Ground, his first album for Atlantic Records. Life Is a Journey followed in 1997, and two years later he released Soldier of the Cross. Big Mon: The Songs of Bill Monroe followed in 2000 and was re-released in 2002 on the Lyric Street label as Ricky Skaggs and Friends Sing the Songs of Bill Monroe. In 2003, Skaggs released Live at the Charleston Music Hall on his own Skaggs Family label, followed by Brand New Strings in 2004 and Instrumentals in 2006. He joined forces with the Whites for 2007's Salt of the Earth. 2008's Honoring the Fathers of Bluegrass paid homage to Bill Monroe's classic mid-1940s lineup of the Bluegrass Boys and featured the only surviving member of that band, Earl Scruggs, as a guest player. For 2009's Solo: Songs My Dad Loved, dedicated to his father, Hobert Skaggs, he played all the instruments and sang all the Vocalss himself, while 2010’s Mosaic, co-produced by Skaggs and Gordon Kennedy, found him singing gospel-inflected country songs with more of a pop and rock feel. Released in 2011, Country Hits: Bluegrass Style saw Skaggs returning to some of his country hits and reshaping them as bluegrass pieces. 2011 also saw the release of a second holiday album, A Skaggs Family Christmas, Vol. 2, a ten-song CD that featured both studio and live recordings and came packaged with a bonus DVD, A Skaggs Family Christmas Live, presenting the family’s holiday concert filmed at the Ryman Auditorium in Nashville. A live set with Bruce Hornsby, Cluck Ol' Hen, appeared at the end of the summer in 2013. 09/1982 SP EPIC 15-03265 (US) . Heartbroke / ? 01/1983 SP EPIC 15-03491 (US) . I Wouldn't Change You If I Could / ? 11/1988 SP EPIC 15-08459 (US) . 10/2005 CD SKAGGS FAMILY 902015 (US) A SKAGGS FAMILY CHRISTMAS - VOLUME ONE - Let It Snow! Let It Snow! Let It Snow! / Little Drummer Boy / What Child Is This? / Love Come Gently / Mary, Did You Know? / Hangin' Round The Mistletoe / Christmas Time Is Here / Deck The Halls / The Christmas Guest / Have Yourself A Merry Little Christmas / White Christmas / Go Thee Down / Do You Hear What I Hear?